KUALA LUMPUR, 25 Nov 2013 – A study by The National University Malaysia (UKM) found most of the elderly in the country face bleak health conditions while more than 50% of them have an income of less than RM500 a month. Due to medical advancement and better medical care the elderly are living longer but unfortunately other things needed to support the longer existence have not grown with life expectancy. 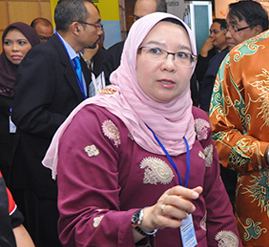 The research was conducted by a UKM team of researchers led by Head of Industry and Community Partnership of the UKM Medical Faculty, Prof Dr Noor Azah Abd Aziz with the help of other researchers and officers from its Community Development office. The findings was tabled and discussed at the National Elderly Symposium (NES) held over six days at the Grand Seasons Hotel here last week. It is aimed at assisting the government formulate a new and more relevant policy on the elderly. Organised by UKM and the KPJ Healthcare University College (KPJUC), the symposium is to chart a new blueprint that can make the elderly look forward to old age instead of dreading it. The survey carried out on 234 elderly people revealed that 28% of them do not have any income at all, 23% less than RM500, 27% less than RM1000, 20% RM2000 and only 2% of them have incomes of more that RM2000 a month. Their medical conditions were also found to be not bright, either because 37.6% are obese, 42.7% suffer from hypertension which skyrocketed their chances to have stroke attacks, 31.7% have either blocked arteries because of cholesterol or heart disease and 24.8% suffer from diabetes. Some of them have more than one medical conditions. It concluded that without divine intervention they are most likely to be bed ridden, before they die. The research did, however, shed some light as to why they suffer such medical conditions, finding that only 0.9% of them engaged in physical activities such as Tai-chi, jogging or walking. A majority of them, 48.7 percent were found to be watching the tv as their way of killing time. Prof Noor Azah and her team was of the view that the untenable figures can be changed or even reversed if intervention programmes like physical activities can be initiated and carried out for them at the community level. The findings also felt that regular medical check-ups can also make a difference. Knowledge of their own health status like blood sugar level can put the brakes on their unhealthy lifestyles. If for example they know their blood sugar count is abnormal, then they will take precautions and stop taking the extra spoon of sugar in their drinks. Not knowing their health status can be lethal and cause them to be bedridden, the findings suggested. The symposium was attended by government bodies, industry stakeholders and the elderly clubs from all over the world.